Last week was all about breakdowns on the yen pairs, so I’m looking at more risk-off plays for EUR/JPY and Guppy. The trend on EUR/GBP, on the other hand, still seems to be intact. So much for that short-term pullback we were waiting for last week! EUR/JPY smashed through the rising trend line support as risk aversion came in full swing. 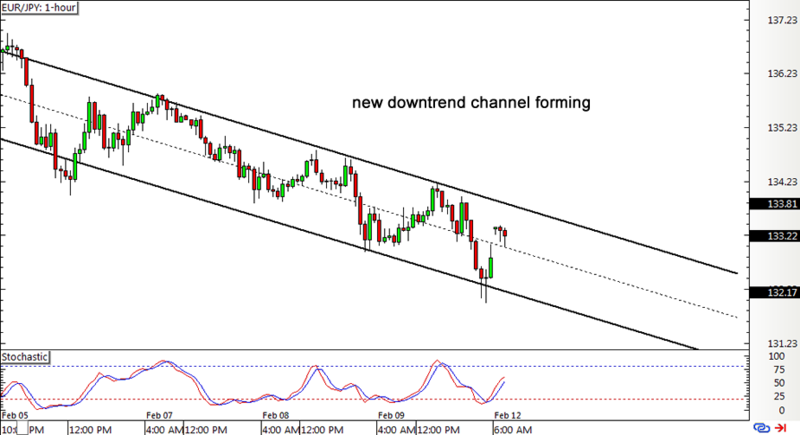 A new downtrend channel appears to be forming on the pair’s 1-hour time frame now while euro sellers get their bearings. 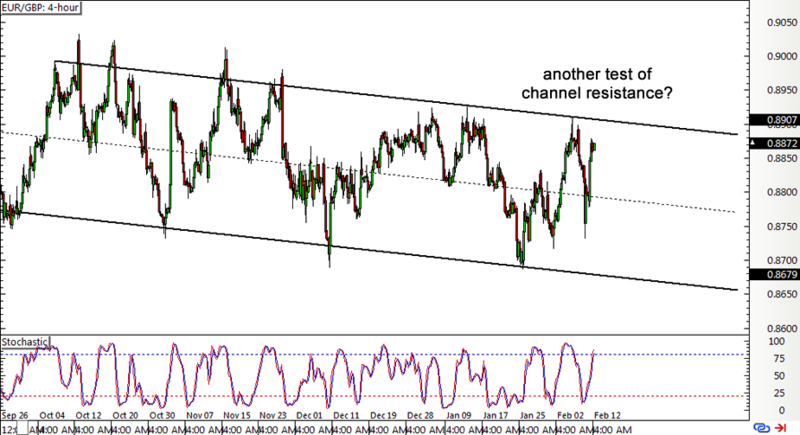 Price gapped up over the weekend but might hit a ceiling at the channel resistance then quickly fill the gap. Note that preliminary GDP reports are up for release from the top dawgs of the region, so these could be crucial in shaping ECB tightening expectations and the shared currency’s direction. Guppy also had its share of losses last week but seems to be finding a floor around the 150.00 major psychological level. 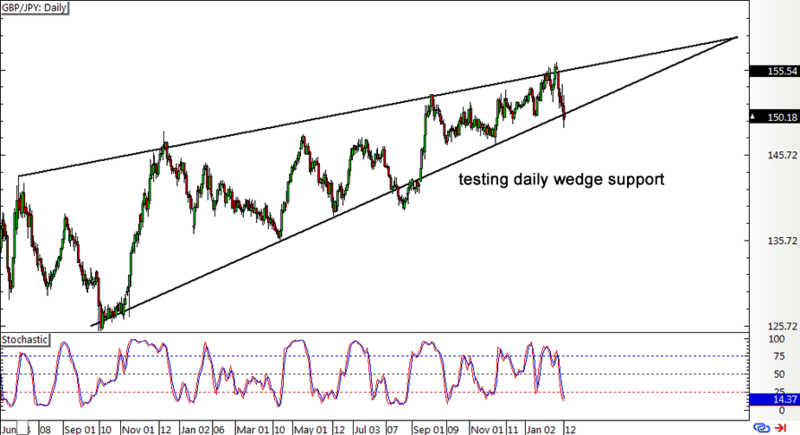 After all, this lines up with the bottom of the rising wedge pattern on its daily time frame. Stochastic is on the move down to hint that pound bears still have enough fight in ’em and could push for a breakdown. However, the oscillator is also dipping into oversold territory to reflect exhaustion among sellers. If pound bulls are able to take over and risk appetite returns, the pair could find its way back up to the wedge resistance. U.K. CPI and retail sales figures are lined up this week, so it could be an action-packed one for this pair. Looks like that small ascending channel on EUR/GBP held up really well and price has steadily made its way back to the top… with a few spikes here and there during the BOE Super Thursday of course! Price is closing in on the .8900 major psychological mark, which might be enough to keep gains in check and push the pair down to the bottom at .8650 or at least halfway through. Buyers appear to have the upper hand for now while stochastic is heading north, but turning lower from the overbought zone could draw sellers back to the mix. Keep in mind that, in terms of monetary policy biases, the BOE has been unabashedly more hawkish than the ECB.